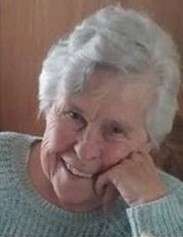 Funeral Services for LaVera Eck will be held at 10:00 a.m. on Thursday, December 6, 2018 at the Friends Church in Las Animas, Colorado. Interment will follow in the Bent/Las Animas Cemetery. Visitation will be held at Horber Funeral Chapel on Wednesday, December 5, 2018 from 3:00 p.m. until 5:00 p.m.
LaVera Opal (Jantzen) Eck was born on January 31, 1927 in Okeene, Oklahoma to Fred and Martha (Hintergard) Jantzen. She passed away surrounded by her family on November 30, 2018 at her home in Las Animas, Colorado at the age of 91. LaVera was united in marriage to Henry Eck on February 1, 1946 in Wellington, Kansas. To this union seven children were born; Wesley, Steve, Russell, Tim, Arlynn, Sharon and Karen. She was a member of the East Side Club and a 4-H leader. LaVera loved planting flowers but loved watching her children and grandchildren play sports even more. LaVera’s life was centered around her husband, her children, and her grandchildren. LaVera is survived by her sons, Wesley (Connie) Eck, Steven (Suzette) Eck, Russell (Chris) Eck, Tim (Sharon) Eck, and Arlynn (Jean) Eck all of Las Animas, Colorado; daughters, Sharon Eck of Las Animas, Colorado and Karen (Allan) Medina of Lamar, Colorado; 15 grandchildren; 16 great grandchildren; brother-in-law, Clayton Koehn; sister-in-law, Katherine Schmidt; many nieces and nephews, other relatives and a host of friends. She was preceded in death by her parents; husband, Henry Eck on July 7, 1989; granddaughter, Wendy Eck; brothers, Johnnie Jantzen and Benhard Jantzen; sisters, Tillie Cayot, Lucille Campbell, Lillian Schmidt, and Evelyn Koehn; and infant twin siblings, Ruben and Ruby. In lieu of flowers, memorial contributions may be made to a church of donor’s choice in care of Horber Funeral Chapel, P.O. Box 431, Las Animas, Colorado, 81054.